Are you a football fanatic? Some teams have quite the dedicated following. Do you travel to all the games to cheer on your favorite team? Are you a tailgating aficionado? Tailgating can be loads of fun and carry quite a tradition but it can also leave behind quite a mess. 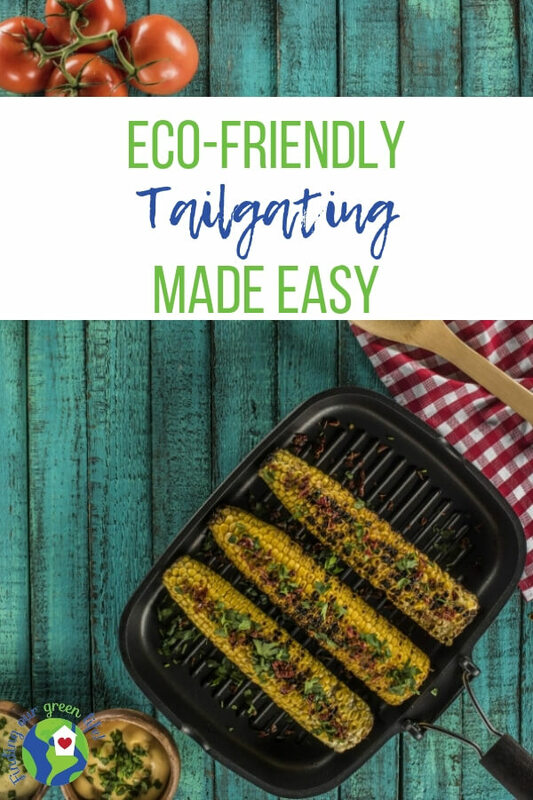 An eco-friendly tailgating event doesn’t have to be difficult. It just takes a bit of preparation. The first thing that comes to mind when I think of tailgating is the food. No one wants peanut butter and jelly sandwiches. Depending on where you are, you might just be in for burgers, hot dogs, barbeque, pulled pork (is that the same thing? maybe it is) and other things that go on the grill. After that, you’ll have your side dishes, chips, fruit, veggies, dessert, and of course beverages. The Grill – gas or charcoal – most charcoal briquettes are made up of a combination of different materials which puts emits roughly 105 times more carbon dioxide than propane. Gas also produces fewer emissions than charcoal when it burns. Another plus, especially when you’re tailgating, gas heats up faster. Prepared Side Dishes – prepare side dishes at home in glass containers and preferably cover with a reusable lid or if that isn’t feasible, aluminum foil. The aluminum foil can be rinsed (if needed) and recycled. You can read more about my experience with choosing a non-toxic food storage solution right here. Fresh Fruit & Vegetables – prepare those ahead of time at home and store in a reusable container. Bring along a platter for serving. If you’re short on time and need to pick up a fruit/veggie platter from the grocery store, make sure you recycle the plastic platter correctly. If you’re unsure if the plastic platter is recyclable, just look for the number in the triangle symbol. For more information, check out Plastics by the Numbers. You’ll still have to check with your curbside hauler or recycling facility to confirm they will accept it. Using reusable containers takes all the guesswork out. Dessert – Make it simple, cookies or bite-sized desserts pack easily and require no plate, fork, spoon or napkin. You can bring them along in a reusable container which makes clean up easy and mess free. Beverages – These days almost everyone has a reusable beverage container so asking your fellow tailgaters to bring their own shouldn’t be a problem. If you have beer cans or bottles, make sure to bring along a specific bin to collect those in so they are easily recycled. Make sure to have both a designated trash bin and a recycling bin. *Disclaimer: All links prefixed with an asterisk (*) are affiliate links. Any purchase you make by clicking these links will earn me a small commission but will not cost you anything extra. Please see my Disclosure page for more details. When it comes to plates, napkins, and utensils, it gets a bit tricky. There’s been a rise in the number of non-traditional disposable options but which one is best? Depending on how many people are joining you, it may be feasible to purchase some reusable plastic plates. I bought a bunch for a birthday party about 10 years ago and still have them. They are lightweight and don’t take up much space. They are similar to *these. While many disposable options are compostable, they are compostable in a commercial facility and not in a backyard compost bin. I don’t have access to a commercial composting facility so I won’t buy those. It’s also important to note, compostable materials won’t decompose in a landfill, the conditions aren’t correct for the process to take place. Plates – go for plates that are made from recycled materials. There are a few options at play here, paper plates made from recycled materials – like these *Chinet plates or plates like *these from World Centric that are made from discarded sugarcane fiber. Both will decompose in a backyard composter, it will just take a bit longer than a commercial composter. Utensils – as much as I hate to say it, I think you’ve just got to go with disposable plastic here unless you’ve amassed a good collection of reusable utensils. From what I’ve read, the majority of ‘compostable utensils’ are only compostable in commercial facilities so unless you have access to one, you’ll have to throw them in the trash anyway. If you make all your tailgating foods finger foods, you won’t have to bother with many utensils. Plastic utensils are generally #6 plastic which means they are made from polystyrene and is not widely accepted at recycling facilities. Napkins – at home and when we travel as a family, we use cloth napkins but when you’ve got a crowd and are away from home, cloth doesn’t make the most sense. For napkins, choose a variety that is 100% recycled paper and made from post-consumer content. *Seventh Generation is a good choice. The biggest takeaway is to be mindful of the products you choose and the impact they will have on our environment. It is possible to have an eco-friendly tailgating event, it just takes a bit more preparation. Make your purchases count and your voice heard by advocating for change with your money. Interested in learning more about finding your own eco-friendly lifestyle without losing your mind? Head here to discover more. Are you a football fan? How frequently do you tailgate? Comment below and let me know if you use eco-friendly products at your tailgate. Is Compostable Cutlery Really Breaking Down?